The largest Alpine pasture in all of Europe, with the villages of Castelrotto, Tires, Siusi and Fiè allo Sciliar, is a famous summer and winter holiday resort. Castelrotto is the main village in the Alpe di Siusi holiday area. The Sciliar - symbol mountain of South Tyrol. Horses at Alpe di Siusi. 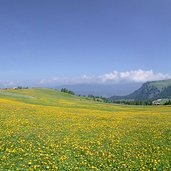 The meadows and pastures of Alpe di Siusi are part of Catinaccio-Sciliar Nature park. Flower meadows at Alpe di Siusi. Siusi allo Sciliar with its 18 holes golf course. Fiè allo Sciliar in autumn. The cane field of the lake of Fiè. The lake is a point of attraction in almost all the seasons. A miniature of Castel Presule, near the tourist office of Fiè. The real Castel Presule near Fiè can be visited. It is one of the most beautiful castles in South Tyrol. Presule castle and the Sciliar mountain in winter. In the winter season, the skiing area of Alpe di SIusi is the main attraction of Castelrotto, Siusi and Fiè. The Sciliar mountain in winter, seen from San Vigilio near Siusi. Sight on Castelrotto in the snow. A network of slopes and lifts serves the Alpe di Siusi in winter. Alpe di Siusi with Sassolungo mountains on a sunny winter day. See panorama A great view from Alpe di Siusi, the largest alpine pasture of Europe, on the Sciliar with Euringer and Santner peaks. See panorama Panoramic view from the trail between Monte Pana and Saltria at march: Alpe di Siusi and mount Sassolungo. We ride our mountain bikes down the old „Latte“ road. This historic road is rich in tradition and is situated on Europe‘s highest pasture. Join us of our tour of the Alpi di Suisi. Right in the middle of the Dolomites, Europe‘s largest alpine pasture, the Alpe di Siusi can be found and not too far away the picturesque village of Siusi is just waiting to be discovered. Surrounded by rolling meadows, mighty forests, sky scraping peaks and mysterious ruins, this mountain village is a must-see for visitors. The Sciliar area is one of the most famous hiking areas in the Dolomites. The popular holiday villages Castelrotto, Siusi and Fiè are characterised by their sunny location and their mild climate. The Ponds of Fiè, situated at the foot of the Sciliar, are an ideal place for relaxing in the nature and enjoying a refreshing swim. 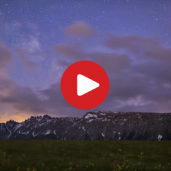 A time-lapsed, breath-taking view on the night sky above the Sciliar/Schlern and the Alpe di Siusi/Seiser Alm. Already Oswald von Wolkenstein knew that Siusi allo Sciliar was a wonderful place to live at, many centuries ago. Probably he felt the magic of the Sciliar, and watched the witches of the Sciliar dance. For sure he also knew how tasty the local apple strudel is. That’s what we also came to discover in our visit to Siusi allo Sciliar. We are in Fié allo Sciliar, at the feet of the unmistakable Sciliar mountain, where legendary witches used to celebrate their rituals. Definitely a worth seeing landscape! This is the native land of the most famous member of the band Südtiroler Spatzen, the musician Norbert Rier from Castelrotto. We visit him in his farm and we will discover his favourite places where he is used to have a break. 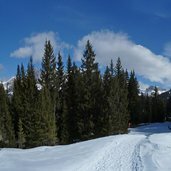 Strapping on our snowshoes, we get ready for a great hike through a winter-wonderland in the middle of the Dolomites. 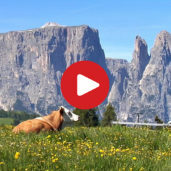 Our tour takes us up on the Alpe di Siusi alpine pasture. Our trip begins at Saltria where we start hiking to the Rifugio Zallinger mountain hut, situated in an area under Mount Sassopiatto. 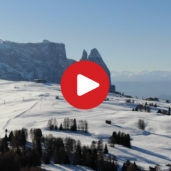 Alpe di Siusi (or Seiser Alm in German) is an ideal holiday resort for skiers, cross country skiers and snowboarders alike. A cable railway will bring you to the winter paradise of Siusi. Those who prefer a rather relaxing kind of holidays can look forward to numerous walking and hiking paths. And what about a comfy trip on a horse drawn carriage across sparkling white pastures and meadows? In summer, you can enjoy a beautiful scenery, characterised by rich green meadows, majestic rocks, mountain lakes and traditional inns and huts. Countless hiking paths and romantic excursions from hut to hut and up to mighty mountain peaks are waiting for you; a great panoramic view will be the reward.